No, I’m not talking about the Hitchcock movie. 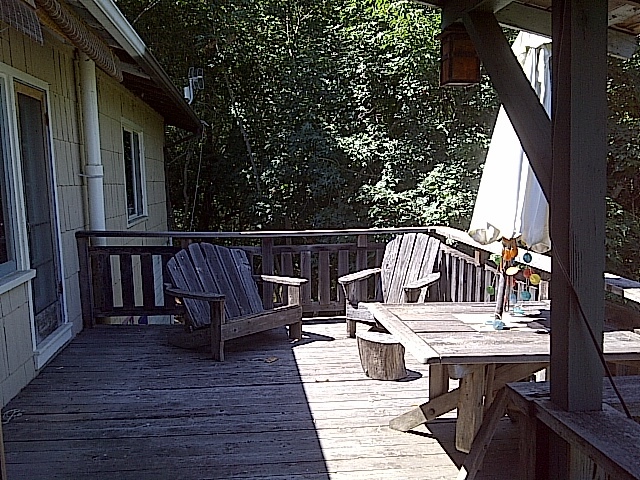 I’m talking about our back deck. Every morning, my husband takes out a cupful of bird seed and scatters it along the deck railing. On the table. Along the ground. Then he whistles. 1. Stellar Jays. Or as we affectionately refer to them: Pig-Birds. These guys come to gobble up whatever we put out there, although I’m not sure how they can eat, what with the squawking and squabbling they do. They land and take off rapidly, they hop at each other to establish some kind of temporary dominance, and they turn their back on the woodpeckers (see below) as if they think this means the other birds can’t see them. Definitely my husband’s favorite. 2. One Scrub Jay. Yes, just one. Okay, maybe there are two, but we never see them at the same time. I know a lot of people prefer the Stellars, in terms of sheer amazing beauty, but–believe me–after fifteen minutes of loud, boisterous, gorgeously BLUE Stellar Jays trying to assert power, one solitary Scrub Jay brings along a subtlety that has its own kind of appeal. 3. Acorn Woodpeckers. These guys hold the true power among the birds, as much as the Stellars try to pretend otherwise. It must be the beaks, right? Because they’re no bigger than the Stellar Jays, and they come nowhere near to outnumbering the Jays on our deck, at least. But, boy, an Acorn Woodpecker lands, and the Jays take off. Yes, they come back, but there’s a space around each woodpecker that they don’t venture into. I guess, if you’ve been sharpening your beak on an oak tree for your whole life, you’re not too worried about a Jay with attitude. Because, for you, it’s only attitude. 4. Juncos. These are my favorite. I leave the attention-demanding Jays to my husband. The Juncos have an intelligent quietude toward them. They don’t get squawked at or chased away much by the Jays, and–for their part–they don’t bother the Jays. They hop around the railing and down on the ground, and they’re perfectly content to hang around into the afternoon to check whether there’s anything left from the morning feeding. They also hang out in the plants at the front of the house, just outside my office window, rustling leaves and doing little flits of movement that I can only just catch out of the corner of my eye while I work. The last week or so, we’ve seen a few juveniles. They hang out with Dad, and–I think–he helps to feed them, even though they’re as big as he is. At least, I think that’s what he’s doing when they touch beaks. Maybe, though, they’re just friendly little parent-child kisses. Whatever–very sweet! 5. Doves. I won’t go on, because I know everyone loves doves. Not me. Ever since I had about a gazillion of them outside my bedroom window, my last year of college, when I lived on Balboa Island, that cooing has driven me crazy. The Jays try to chase the Doves off, and–frankly, I’m cheering the Jays on–but it doesn’t work. They are just too stupid to get that they’re being pushed around. Or to stop cooing. Sheesh. We have a couple of other occupants on that deck. We sometimes get a couple of Black-headed Grosbeaks and an occasional California Towhee, who I love–such a beautiful pinky brown and hard to watch for any amount of time, because he takes off quickly. We have ONE SQUIRREL that has found its way to the feeding party, and let me tell you, that squirrel does not leave much for the birds. Once he’s there, even the woodpeckers don’t mess with him (HOW does a squirrel outrank a woodpecker beak?). And while the birds peck and grab, that squirrel is like the most powerful vacuum cleaner you’ve ever owned. He pretty much moves along the railing and hoovers up everything there. I wish I could get my pots and pans that clean. I like the squirrel better than the doves, but still…I wouldn’t mind him sharing just a little more, so the Juncos would have more to come back to in the afternoon. The last member of the deck club? My cat. If she gets herself established out there, usually in the shade under one of the chairs, the birds will show up and nobody bugs anybody else. They must realize she’s there, right? But she’s old and deaf enough to just lay there and enjoy the sun and the view, and the birds keep eating along and hanging about. Animal dynamics: Go figure. I don’t consider myself a birder. The idea of a life list fills me with intimidation and panic. But something about having lived in this house for almost 20 years and watching the comings and goings, the new arrivals, makes me feel at least a little connected to “our birds.” At least enough to keep buying that bird seed.